Want a Mezuzah for your Dorm Room or apartment? Chabad has them, Free of Charge. What is a Mezuzah? A Mezuzah is a Parchment scroll that has been written by a professional scribe, usually in Israel. It contains two portions of the Torah that discuss the Jewish Faith. Every Mezuzah, no matter how simple or elaborate the exterior casing may be, contains the exact same inscription, the Shema Yisrael: "Hear o' Israel, the Lord Our God, the Lord is One." It is traditionally attached to the doorposts of a Jewish home. Maimonides writes that the Mezuzah reminds us of the presence and the Unity of G‑d, arousing us to remember and love G‑d and follow His path. A ‘kosher’ Mezuzah also brings protection and blessing - whether you are home or away. The free case provided in this offer, is made of white or clear plastic. Or, you may provide your own case! For more on Mezuzah click here. What if I want to buy a Mezuzah? That’s great! We will be happy to sell you a Mezuzah, or we can direct you to a Judaica store that has a broad selection of Mezuzahs and cases. How do I get one for free? Fill in your information below and we will contact you. Once signed up, we will ask for a $20 dollar deposit from you. 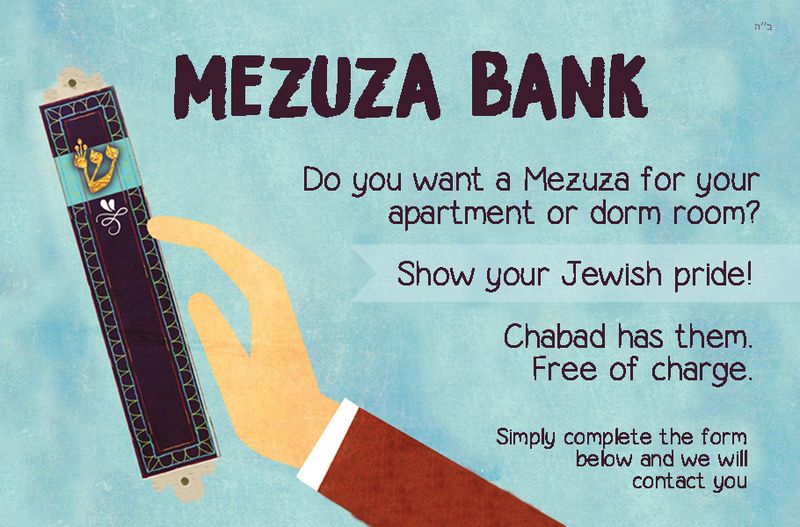 This deposit will be refunded when you return the Mezuzah at the end of the year. There is a limited supply – please act soon. Or email us at Mezuzah@jewishriceu.com.